More than 2,700 astronomers from around the world are convening in Austin, Texas from Jan. 8-12 to discuss the latest discoveries from space at the 219th meeting of the American Astronomical Society (AAS). The meeting will feature the newest findings about some of the biggest mysteries of the cosmos, including dark matter, dark energy, alien planets, and more. SPACE.com's Clara Moskowitz and Denise Chow will provide complete coverage from the 219th AAS meeting. You can track the conference on Twitter by following Clara (@ClaraMoskowitz) and Denise (@denisechow) and by following the hash tag #AAS219. Distant space bubbles may hold clues to the history of our own sun. The James Webb Space Telescope is pegged to receive nearly $530 million in the 2012 fiscal year. With NASA operating on an increasingly tight budget, the agency's ability to launch future large astronomy missions is at risk, scientists said. Our galaxy is aptly named the Milky Way — it looks white, the color of fresh spring snow in the early morning, scientists now reveal. It's a popular saying that international borders aren't visible from space, but it's just not true, says one veteran astronaut. An enigmatic object detected five years ago in space may be a ringed alien world comparable to Saturn, the first such world discovered outside our solar system, scientists now say. 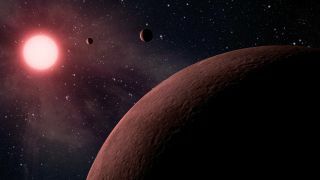 A team of astronomers has put together an online catalog of alien planets to help researchers and the public keep up with the intensifying flurry of exoplanet discoveries. See amazing images and photos of space discoveries unveiled in the 219th American Astronomical Society in Austin, Texas. In an age of dwindling budgets and political pressure for research to provide tangible benefits to society, a prominent astronomer says science should aspire to more than that. See how the small alien planets stack up to our own solar system and Jupiter in the SPACE.com infographic above. Astronomers have discovered the three smallest alien planets yet, including one that's just the size of Mars. The alien worlds, detected using publicly available data from NASA's Kepler mission, are 0.78, 0.73 and 0.57 times the diameter of Earth, respectively; the smallest one is roughly Mars-size. Alien planets are incredibly common in our Milky Way galaxy, outnumbering stars by a large margin, a new study suggests. On average, each of the 100 billion or so stars in our galaxy hosts at least 1.6 planets, according to the study, bringing the number of likely alien worlds to more than 160 billion. To celebrate the challenges and achievements of 50 years of human spaceflight, retired NASA astronaut Steven Hawley gave a special lecture Monday (Jan. 9) here at the 219th meeting of the American Astronomical Society. The National Science Foundation released a tongue-in-cheek look at the dos and don'ts of space funding. The largest cluster of galaxies seen yet in the early universe, a giant that astronomers have dubbed "El Gordo," could one day reveal secrets about the invisible dark matter that fills the universe, researchers said. Now that astronomers have found more than 700 alien planets around other stars, it's time to get serious about characterizing what those planets are like, say scientists proposing a new telescope mission. Scientists are performing a census of the stars in the Milky Way in an effort to piece together the history of how our galaxy formed. When a team of researchers sifted through old data from the Hubble Space Telescope and discovered two hidden alien planets that had gone unnoticed for 13 years, they inadvertently found a new way to seek out alien worlds. The densest regions of the dark matter cosmic web host massive clusters of galaxies. The James Webb Space Telescope (JWST) could be used as a powerful tool that will enable astronomers to "sniff" the atmospheres of alien planets, according to David Charbonneau, an astronomer at the Harvard-Smithsonian Center for Astrophysics in Cambridge, Mass. Astronomers should hunt for worlds like the fictional Tatooine in "Star Wars," say researchers calculating whether Earth-like planets can exist around paired stars. Astronomers might do well to prepare themselves for disappointment, as the tightening federal budget looks to deal a weighty blow to funding for astronomy research this year. The hidden side of the universe is now a bit more illuminated thanks to the largest map yet of dark matter, the strange substance thought to inhabit much of space. This year, skywatchers will have the chance to see an astronomical event so rare that it will not occur again for another 105 years: the shadowy passage of Venus across the face of the sun.